I am wearing the costume, I am also the one who put it together. I've always really loved going to Disneyland in California and meeting all the characters since I was little. I went to Disney World In Orlando two years ago for the first time. I have mickey ears from both parks. 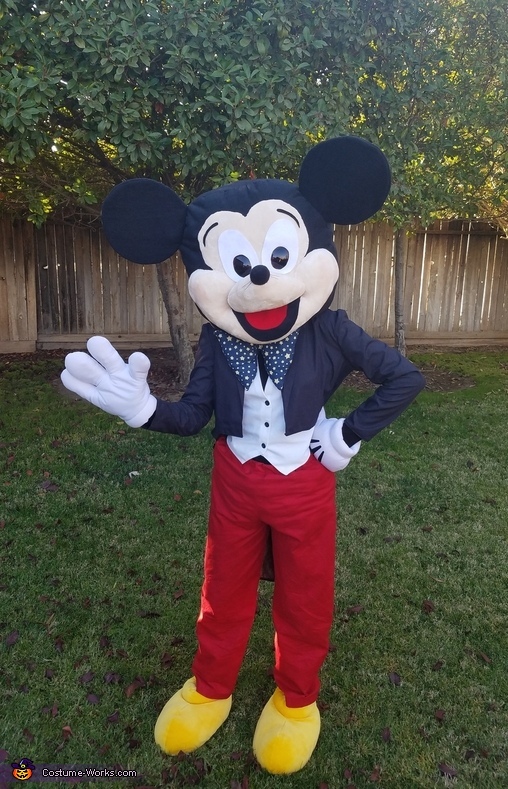 So this Halloween, I decided it would be fun to go as Mickey Mouse. The outfit part was quite easy, I just got some basic patterns and fabric for the vest, jacket, and pants, from my local Joanne's Craft store. The head was another matter entirely, it took the longest and was a huge pain in the neck (figuratively and literally if I wear it for too long!) to make. The main structure of the head was crafted from chicken wire from Home Depot. After I created the basic round shape with the wire, I tucked the rest of the wire into a circle of foam at the base of the head. I took stuffing and stuffed the black head and face part and sewed over that. The ears were made from cardboard I cutout into circles, and they were flopping over so I used some left over chicken wire to stick it through the base of each ear and glued down the bottom of the wire. The whites of the eyes were cut from white felt from the craft store, and the black of the eyes, were sunglasses I purchased from Walmart. The bow was hand sewn with fabric and more stuffing from an old pillow. The shoes were purchased from Ebay and the gloves I found in my garage, purchased from a trip many moons ago to Disneyland. I also created the tongue, the black of the mouth, and the eyebrows from fabric felt which was 99 cents each. I bought a broom from the dollar store and cut a few pieces off it and painted them black and glued them on as whiskers on the nose, for added mouse effect. I'm wearing underneath a black turtle neck from a store I don't remember, I cute holes in it so I could stick my thumbs in it so my skin didn't show between where the gloves end and my tux begins. I glued on Velcro straps onto a bicycle helmet and inside the head and then placed the helmet inside so it fits onto the velcro. With that, I can turn my head and the mickey head will turn with it. It's a pretty functional costume, and has a few air holes so I get pretty good ventilation in there. I also added some stuffing in the pants and a little blush to the cheeks so he looks even sweeter. And viola! Mickey Mouse was born! He was a huge hit with kids and adults alike when I went outside. It brought a lot of joy to the kids who got to meet their hero and ask me where Minnie Mouse was. I wasn't surprised how excited the little ones were. However, I had two grown men chase me down the street so they could take a selfie with me. That was a little surprising,  but It was great fun!